The range of the Goodfellow's Tree-Kangaroo is New Guinea. 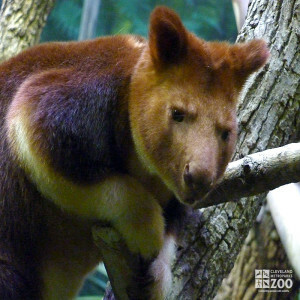 Goodfellow's Tree-Kangaroos inhabit Montane oak forest at altitudes in excess of 4,000 feet. Gestation in Goodfellow's Tree-Kangaroos lasts about 32 days. Goodfellow's Tree-Kangaroos have a litter of 1. Goodfellow’s Tree-Kangaroo is usually reported to be nocturnal in densely settled areas. In captivity and in the wild in rarely-visited areas, however, it appears to be most active in the morning and afternoon. Its activity patterns may be modified by intense hunting pressure. Male-female pairs have been seen together occasionally, which is unusual for the genus Dendrolagus. It is generally common in areas where human population density is extremely low. They appear to be primarily leaf-eaters, but they will also eat fruit when it is in season. They forage for food on the ground, but remain near trees where they can take refuge if threatened. They have a slow metabolism, which is an adaptation to a diet of leaves. 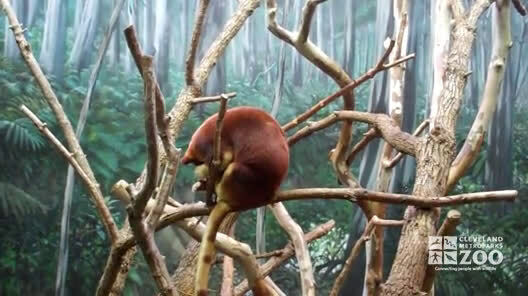 After feeding, a tree-kangaroo saves energy by sleeping while it digests its meal. They may sleep as much as 60% of the time, and since they do not appear to have any regular sleeping sites, they snooze wherever they feel safe from disturbance. There is believed to be no well-defined breeding season for Goodfellow's Tree-Kangaroos. The young first emerge completely from the pouch at about 305 days, and by about 408 days they will suckle by just sticking their head in the pouch.